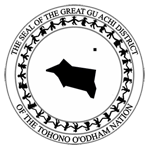 The Gu Achi District is part of the Tohono O'odham Nation. Our District Lands are in the Center of the Tohono O'odham reservation and 42 acres about a mile west of the Town of Florence Arizona. Within the Gu Achi District lands are the Communites of Ak Chin, Cababi, Covered Wells, Florence, North Santa Rosa, Oakum Kuk, Palo Verde Stand, San Luis, Santa Rosa and Sikol Himatk. Other Communities that exist but are Represented by larger Communities are Ma'isp Wawhai (Covered Wells), Mountain Village (Covered Wells), S-huhujudig (Santa Rosa), Upper Village Covered Wells and West Santa Rosa. There are several governmental structures on the Gu Achi District Lands: On Arizona State Route Highway 86 the KOHN 91.9 FM Studio (Hewel Ni'ok) stands just west of the Gu Achi Trading Post. The antenna for the studio stands on top of Jewek Duak, Southwest of the Studio. The Ajo Ambulance mobile station stands at mile marker 91 in Covered Wells. On Federal Indian Route 15 in an area now known as Sawkud Ke:k near the Ak Chin turn off consists of the Archie Hendricks Sr. Skilled Nursing Facility (AHSSNF) which is located at mile marker 9, the Tohono O'odham Health Transportation and just east of the AHSSNF is the Tas Tonolig Ki Day Program (SMI) which provides services for SMI individuals across the Tohono O'odham Nation. In the community of Santa Rosa is the Santa Rosa Health Center (IHS Facility). The Healthy O'odham Promotion Program (HOPP) Modular stands beside Palo Verde Road. There is another Ajo Ambulance mobile station located within the Gu Achi District Compound. The Santa Rosa Day School (SRDS) stands at mile marker 14 on Federal Indian Route 15. This website has been setup to allow the citizens of the Gu Achi District access to forms, event information, district and Nation contact information online. We are continually updating our website, if there are any questions regarding issues on the website, contact Chairman Willard Anita at 520-483-3080 or contact by e-mail.